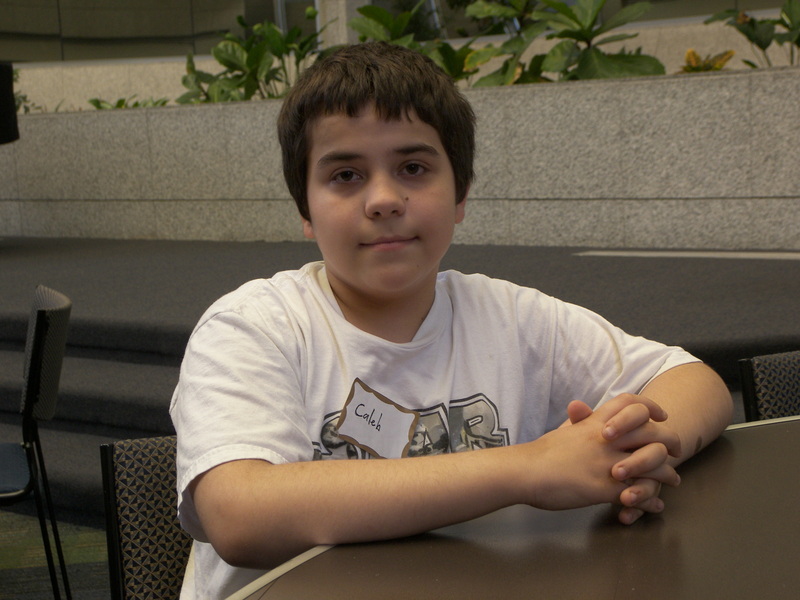 Caleb has entered the seventh grade…..
As part of our ongoing effort to increase awareness among those involved with children with Essential Tremor, we will be following the experiences of Caleb, a boy with Essential Tremor, as he goes through the seventh grade. Caleb Eaton has entered the 7th Grade! He recently turned 13 and is waiting to get some assistive technology to help with all the note taking and papers that the 7th grade requires. His mother, Kathleen, received his updated IEP which includes allowing Caleb the use of an assistance device. She and Caleb are still waiting, but know he will get help soon. We will let you know when and what he receives to help him continue his success in school. He was inducted into The National Honor Society while in the 6th grade. He has definitely come a long way! We all wish him a fun and successful 7th grade. View past blog post on Caleb. I feel like I was one of the lucky ones to be included in the focus ultrasound clinical trials at the University of Virginia. This experimental procedure was done at no cost to me through a federal grant. My sister read about the trials in the Richmond newspaper. When I first inquired about the program the possibility of acceptance was bleak. Hundreds of people were interested and I was pretty far down on the list. However most of these could not meet the designated criteria. Prior to being accepted I had to undergo 3 days of testing over a 3 month period. The tests and interviews were administered by a variety of doctors. I met with the UVA coordinator, the surgeon who would perform the procedure ( Dr. Elias ), a neurologist, a physical therapist, a psychiatrist, and a psychologist. I had to have ekgs, bloodwork, and a catscan of the brain. On 9/7/11 I reported for surgery. My head was shaved and rubber tubing was placed on my head. The operating room was filled with doctors as well as the engineers who built the ultrasound machine. I was placed in a catscan for about 7 hours. It was a long process for me since it took a long time to line up the scanner before they zapped my brain. I was zapped more times than I can remember. I had 3 follow up visits to Charlottesville to be checked out by the team. They were genuinely interested in how I was recovering. They were very professional and very caring. What a great group. Prior to the procedure I was told that it would only improve my right hand and it was successful. I can now write in a checkbook and eat in public. I was hoping it would take away some of my head tremors but it didn’t. Head tremors are most common in women. I have had tremors in my hands since I was in my 20s and they started in my neck/head in my 40s. Even though my right hand is normal, I still have tremors in my head and left hand and my voice is shaky. If I get nervous or do anything out of the ordinary my tremors increase significantly. ET destroys your confidence and it hard to find jobs. You are also aware of people staring at you in public. I am extremely thankful to Dr. Elias and all of the others that made this a success. This gives encouragement to those with ET. I hope that this process can be used to treat/cure other conditions in the future. Over the twenty-four years I’ve lived with essential tremor, I’ve found ways to deal with the annoying eating and drinking problems caused by tremors. I’d like to share them with you. Tall drinking glasses are like me: top-heavy. They are easy to tip over. Using wide, bottom-weighted drinking glasses has saved me from spilling drinks more times than I can count. 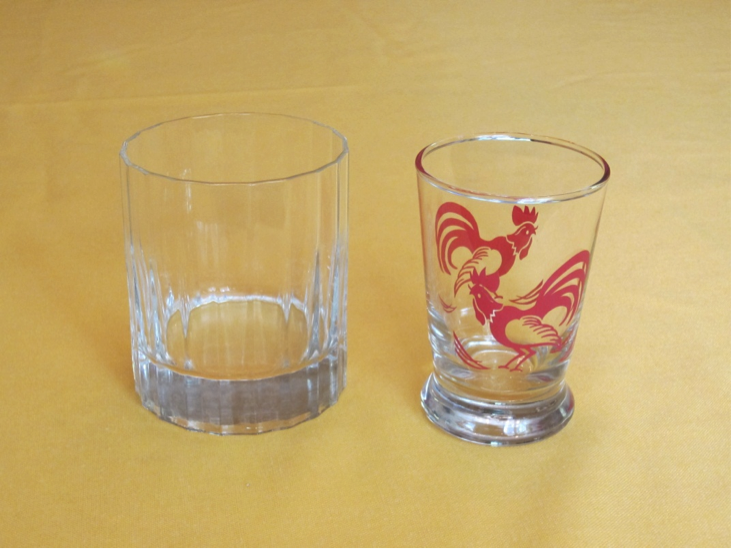 You can ask a waiter for a low ball glass like the one on the left below at a restaurant. Heavy knives, forks and spoons are easier to handle. Their weight means they don’t respond as much to hand tremors. There is no need to reinvent the wheel. I found what I needed advertised to help arthritis sufferers. 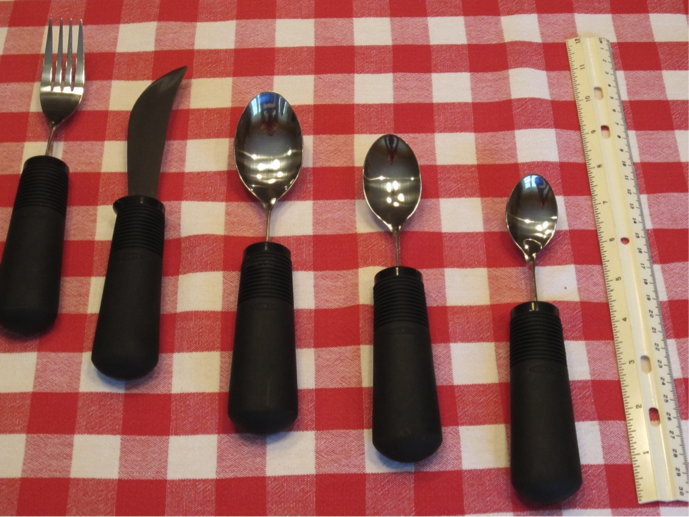 The utensils in the picture below, Oxo Good Grips, with broad slightly weighted handles, have helped counteract my tremor and made eating easier. I found them online under “aids for arthritis.” I wonder if a wrist weight would help as well. Please add your tips on this or other issues. Help with handwriting for a person with hand tremors is something I’d like to read. Post it on this blog. There is currently a lot of discussion within the ET research community as to whether Essential Tremor is neurodegenerative. If it is, there is further debate as to what percentage are neurodegenerative of those who have been diagnosed with ET. When I was first diagnosed with Essential Tremor, I was told I had Benign Essential Tremor. If ET is neurodegenerative, it certainly is not benign. At a time when a lot of attention (rightly so) is being given to the neurodegenerative aspects of such conditions as Alzheimer’s, Dementia, and Parkinson’s, I feel that special attention should be given to this possibly life-altering aspect of Essential Tremor. This may seem strange to some, but I’ve learned that even challenging situations are signs that positive change is occurring. For example, I have a huge estate on the market which is my dream house. My realtor, handyman, friends and I worked very hard to get the house clean, fixed and ready to sell. I found myself working night and day to paint, clean and stage the house. In the middle of cleaning out my art studio I started to cry for two reasons. One reason was I was selling my dream home, even though I knew it was the right time, it felt like losing a part of me that felt safe and peaceful. The second reason was my tremor was worse and I was overdoing it. I’ve learned that the best way out of feeling sad or depressed is to do something in order to feel better. I asked myself what would make me feel better. I know that crying is a good release and opens the heart. This was good for me instead of suppressing my emotions. Even men are doing more of it on shows like The Bachelorette when they get disappointed that they lost the girl they had their heart set on. I’m glad that it is OK to feel our emotions these days. Getting out of a depressed state takes action so I asked myself what would make me feel better. I followed my intuition to call a friend to go to a movie. I wanted to get out of the house and I realized that I was hungry too, which can definitely affect my tremors. While eating I explained to my friend my situation and why my shaking was worse than usual. Guess what, it improved by eating and sharing. When I returned home, I felt better and I was shaking less. I got a good night’s sleep and got busy preparing the house for my Mother to visit me while her bathroom was being converted from a bathtub to a shower. I wasn’t sure I could handle it before my outing, but now I had the energy and faith that all would work out fine. She has a tremor too and can get irritable when her medication isn’t working or when she doesn’t get enough sleep. When she arrived, Mother even made the comment that she thought she might be depressed. I thought to myself, what can I do to help her feel better? I have realized that it is often the little things that help change our attitude. I helped to make her physically comfortable by feeding her and helping her bathe. I then showed her how to play solitaire and mahjong on my iPad. I saw that cute “little girl smile” cross her face. For a couple of hours, Mother forgot she had a tremor and decided she wanted an iPad to play games on and the touch screen was easy for her to use. I ended up giving her one for an early 86th birthday gift (her birthday is not until the end of August). She is now showing other seniors how to use it. One lady called me on the phone about joining the ET support group. She said that she doesn’t leave the house and has a company bringing food to her. She is 60 years old. I asked her the reason she stays home. I wondered if she had another illness besides ET. Her response was that she lives alone and doesn’t want to eat in a restaurant in front of people. “I think I’m depressed,” she said, “because I don’t feel like doing anything.” I told her that it would take courage for her to come to the meeting but that I know she would feel better if she did. She is working on getting a ride. I hope she comes. Sometimes embarrassment or social phobia due to tremors can lead to depression. Clinically speaking, depression is described as anger turned inward about a situation, in this case ET, lack of interest in life due to frustration about it. It can cause a person to decide not to feed oneself or function at all. I feel sad when I hear about this lack of freedom. I’ve been there before, until I decided to open up, tell others and find everything I can to feel better, such as medical discoveries, natural remedies or doing the simple things that help me to take action to improve my life. Most of the time, I’m now waking up as someone with a purpose, a simple one, to love and accept myself and others with or without tremors. I was guided to become a counselor when I decided to take action and ask for a purpose. I will do all I can to research and find new ways of living with or eradicating ET, a condition I have had all my life. I have found that light always shines after darkness. I’ve seen people with tremors so severe that they could barely function and others with less frequency. Some are focusing on what they can’t do and others want to know techniques for feeling better. I now choose the latter. What I love about conferences and support groups is we can all work together to learn from the medical community about research, and experiment and share with each other how we can improve our quality of life each day. 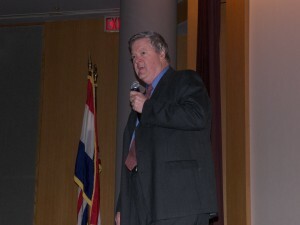 Peter Muller made a presentation to the two St. Louis Support Groups at St. Luke’s Hospital on May 19th. It was well attended. Due to a notice in the newspaper, several people who had not previously been to one of our meetings came. Also there were Caleb Eaton and his father, Robert. Please note the accompanying article on Caleb. The presentation centered on the symptoms and treatments for Essential Tremor and what is happening in the research world to address these. Peter also spoke about HopeNET and what it is doing to increase awareness of Essential Tremor. There were some very good things that came from the meeting. My neurologist called to tell me that one of his patients told him that she had learned so very much from Peter’s talk. The Doctor then called me to get the name of the Doctor who could tell him more about the Focused Ultrasound System (ExAblate 2000). This leads me to believe that some doctors are as interested in learning more about Essential Tremor and its treatments as those of us who have ET. Several of the regular members of the group phoned me after the meeting to tell me how much they appreciated the meeting. Also, Peter’s visit and his talk encouraged the people in attendance to know that there is hope for development of more and better ways to treat Essential Tremor, and that it is the responsibility of each of us to participate in raising awareness about ET in order to promote funding for research. In summation, I believe that the presentation energized our group and made all of us aware that there really is hope…..but that we must all work for success! Caleb Eaton, the 13 year old son of Robert and Kathleen Eaton has had Essential Tremor since he was 2 years old. He just completed the 6th grade and is doing well. Kathleen has made great effort to learn about ET and to take what she has learned to Caleb’s teachers, counselors and to other people at Hazelwood West Middle School. The school is attempting to get some technology that will help Caleb with writing, etc., when he starts 7th grade next fall. Because of Kathleen and Robert’s efforts, and Caleb’s strong will to succeed, he is doing well in school and is happy to know that this picture of him and this information may help other young children know that they are not alone and that they too can triumph over ET. We, here at HopeNET are so pleased with Caleb’s progress and wish him success in all his endeavors. We also understand that without the help of his parents, things would be much more difficult. I know it sounds trite but HopeNET is about hope. We aim for something higher than just being a source of information regarding Essential Tremor. We do plan to provide information but we also want to be a gathering point in which people affected by Essential Tremor can come to feel part of a community. Almost all of us who have ET have felt that sense of being alone. At one point or another, we have been reluctant to speak or hesitant to meet people. HopeNET is not offering a magic elixir. Rather we are a forum in which we can share and help each other deal with this condition. We want to see a better appreciation for the difficulties facing those with Essential Tremor. I am well aware that there are a number of other neurological conditions that are devastating. But I have seen first hand the lack of appreciation of the difficulties we face on the part of the overall community in which we live and the medical community in particular. One of HopeNET’s primary goals is to foster better consideration of Essential Tremor. We plan to do that by working collectively to inform others. This will require a medium for fostering mutual understanding and help for those affected by ET. HopeNET’s website will primarily be that medium. An example is coping mechanisms for dealing with ET. We all have learned some means of dealing with the condition. There is much to be gained by sharing what we’ve learned so that our lives are made easier. But I see the need to broaden HopeNET’s scope. What about something like internal tremor? I have heard countless stories about its effects – that are almost traumatic at times. Yet few outside those with ET know about it, and that includes most of the people in the medical community. HopeNET intends to work very hard to make people aware of it and hopefully provide better consideration for those affected by it. We want HopeNET to be a two-way street. We will all benefit by sharing our experiences. In the process, this should lead to an increase awareness of Essential Tremor – the ultimate goal. As with any organization, it is people who make it successful, and there are many who have helped create HopeNET. I am very thankful to all of them. First and foremost is Rose Schooff who has created the website. In addition to her technical expertise and hard work, she has brought a real appreciation of the difficulties and challenges facing a person with a little-known neurological disorder. Justin Trent and Kelly Helmuth of the law firm of McGuire Woods in Richmond have handled all the legal work involved in getting HopeNET incorporated and tax-exempt. It has involved a lot of work for which I am very appreciative. Kathleen Welker of Tremor Action Network has worked collaboratively with me from the outset providing valuable insight and support. Special thanks are in order for Dr. Stephen Grill. In addition to being the President of the Board of HopeNET, members of the Columbia support group use his office every month for their meeting. He also played the central role in putting together the one-page brochure that we will be giving to doctors to increase awareness of Essential Tremor. Lourdes Cuevas of Capital One Bank has been very helpful in creating and supporting HopeNET’s bank account. Mary Fitzpatrick has been solid in providing support as HopeNET has gone through the usual growing pains to be expected with a new organization. Thanks too to my brother, Skip – a CPA, for handling all tax-related issues. There have many more who have contributed money and/or time – Joan Marie Barringer, Fred Berko, Becky Epton, Lou DeVaughn, Phillip Fauntleroy, Sue Fillmore, Sheliah Hurt, Steph Jewell, Doris Mapes, Barbara McCarthy, Robert & Vera Mendoza, Dan & Shirley Miller, Fatta Nahab, Nora Rudd, and Claudia Testa. I am especially appreciative of what Joyce Letzler has done. Finally, I want to thank my wife, Pat. She has contributed a lot in making copies, handling correspondence & phone calls, reviewing & editing various things I have written, providing ideas, etc. Just as importantly, I have had Essential Tremor throughout our marriage, and she has made my life easier by doing many every-day things to help me.